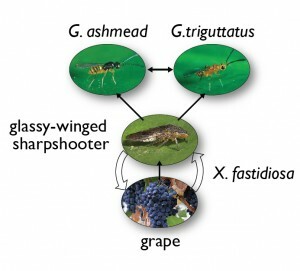 The invasiveness of the polyphagous glassy-winged sharpshooter (Homalodisca vitripennis (Germar), GWSS) using the PBDM approach. GWSS is indigenous to the southeastern United States and northeastern Mexico, and extended its range into California USA in 1989. 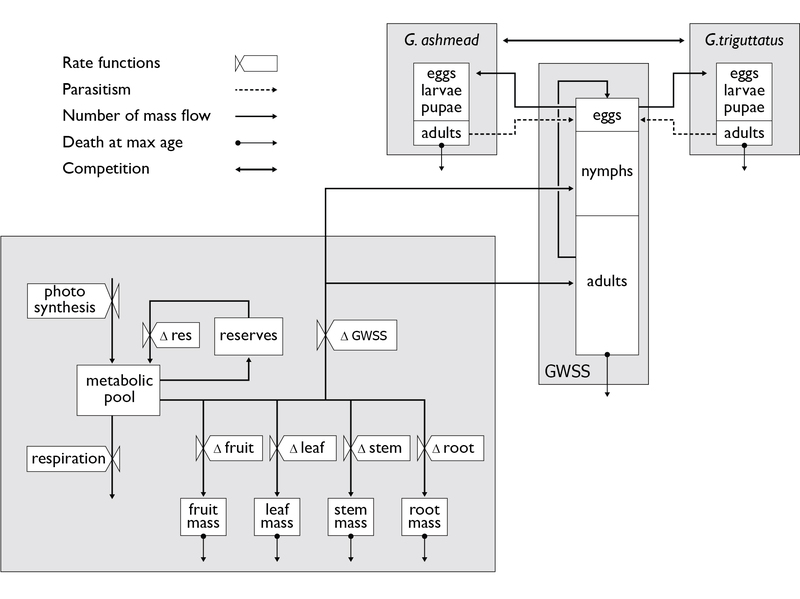 GWSS is a vector of the pathogenic bacterium, Xylella fastidiosa (Wells et al. 1987), which causes Pierce’s disease (PD) in grape and scorch-like diseases in other plants (e.g., oleanders and almonds). PBDMs for GWSS and its two egg parasitoids (Gonatocerus ashmeadi Girault and G. triguttatus Girault) were developed and linked to a PBDM for grape published by Wermelinger et al. (1991). A simple temperature-dependent rate model was developed for X. fastidiosa. We used this PBDM system to assess the invasive potential of GWSS in California, and the efficacy of the biological control program based on the two egg parasitoids. Daily weather data (temperature and solar radiation) from108 locations across California for the period 1995-2006 were used to drive the system model. The predicted geographic range of GWSS in California accords well with field observations showing it is largely restricted to the warmer areas of the southern part of the state. The model predicts that G. ashmeadi is considerably more effective in controlling GWSS than is G. triguttatus. The combined action of both parasitoids reduces the GWSS abundance > 90 percent, with the average indispensable mortality contributed by G. triguttatus being <1%. The geographic range of favorability of the pathogen X. fastidiosa is restricted by cool temperatures to the warmer inland areas of southern California, with the biological control of GWSS serving to decrease its geographic range further. Climate warming scenarios of +2ºC and +3ºC suggest that the distribution and severity of GWSS and X. fastidiosa will increase, especially in the agriculturally rich Central Valley of California. Gutierrez, Andrew Paul, Luigi Ponti, Mark Hoddle, Rodrigo P.P. Almeida and Nicola A. Irvin (2011). 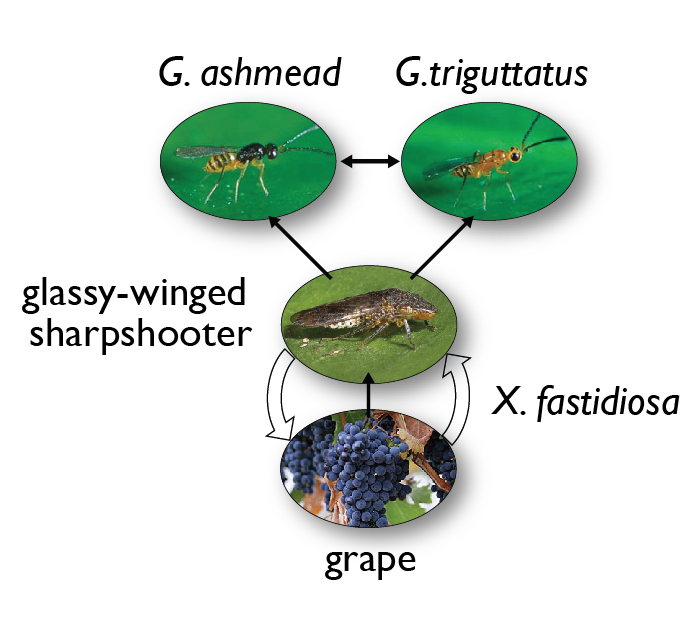 Evaluation of the factors affecting the geographic distribution and abundance of glassy-winged sharpshooter (Homalodisca vitripennis Germar) and two egg parasitoids in California– Environ. Entomol. 40(4):755-769.